Jean Harlow was born on March 3, 1911 as Harlean Harlow Carpenter, the only child of Mont Clair Carpenter and Jean Harlow Carpenter. Her father was a successful dentist in Kansas City, Missouri. Harlean’s father came from a working-class family, while her mother was the daughter of a wealthy real estate broker and his wife. Jean Carpenter’s marriage had been arranged by her father, which eventually resulted in strong feelings of resentment from Jean. The Carpenter family lived in a very large home that was owned by Harlean’s affluent grandfather. The Carpenter’s daughter was the only grandchild and was given the nickname “The Baby”. This name stayed with Harlean throughout her life. She was a very pampered child and was very close to her mother. She only learned her real name was not “Baby” after beginning school at the age of five. Her education took place in private boarding schools. In 1922, her mother filed for a divorce (a rare and scandalous occurrence at that time) and was granted custody. Her mother’s dreams of becoming an actress led to a move to Hollywood in 1923. Unfortunately, Harlean’s mother was unable to get any work as an actress and in less than two years they moved back to Kansas City. During the summer of 1925 Harlean was sent by her grandfather to a summer camp in Michigan. She caught scarlet fever (she had already had meningitis when she was five). These illnesses may have contributed to the more serious health issues leading to her early death. At 15 Harlean was attending a private school in Illinois when she was introduced to Charles McGrew, the nineteen-year-old heir of a family fortune. They fell in love and were married in 1927, releasing Harlean from her mother’s control. The next year McGrew received part of his inheritance, allowing the couple to move from Chicago to Beverly Hills, California. Harlean had not only escaped her controlling mother, but had also become part of the wealthy social circle. One day while driving a friend to an appointment at Fox Studios, Harlean was spotted by executives who were impressed enough by her to give her letters of introduction that would get her in to see members of the Central Casting bureau. Spurred on by a dare from her friend and her mother’s encouragement, Harlean went to see them, signing in using her mother’s maiden name, Jean Harlow. Jean’s newfound fame resulted in tension in her marriage and in 1929 she and her husband divorced. Jean’s big break came in 1930 when Howard Hughes cast her in a “talkie” remake of Hell’s Angels. She was signed to a five-year contract and acted in movies such as The Public Enemy with James Cagney and The Secret Six with Wallace Beery and Clark Gable in 1930. In 1931 she appeared in Platinum Blonde with Loretta Young. The critics were not impressed with Jean’s performances, calling them “plain awful”, but the public reception was another story. Jean packed theaters when Hughes sent her on a public appearance tour on the East Coast and he even extended her tour into 1932. Women began to bleach their hair to resemble Jean’s “platinum blonde”. Hughes, ever the entrepreneur, decided to capitalize on this hair craze and offered $10,000 to the beautician that was able to match the exact shade of Jean’s hair. Jean had been dating the MGM executive Paul Bern, and in 1932 he convinced MGM head Louis B. Mayer to buy her contract from Hughes, despite Mayer’s distaste for Jean’s “floozy” image. Bern made the announcement to Jean on her 21st birthday that her contract had been sold to MGM. In July of the same year, Jean and Paul Bern were married. Later that year, on September 5th, Bern was found dead and despite suspicious circumstances, his death was ruled a suicide. Later inquiries point to a former flame that killed herself within days of Bern’s death. 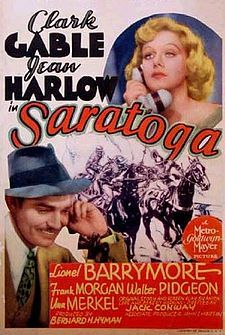 Harlow’s final role was in SARATOGA (1937) with Clark Gable. Despite the scandal surrounding her husband’s death, Jean became more popular than ever and it was at MGM that Jean achieved real stardom. She was featured as a beauty, but also cast in comedies, which turned out to be her strength. MGM restyled Jean from a brassy blonde to Mayer’s preferred all-American type starlet. Jean’s name on a billboard had the power to enable other rising stars in the MGM stables, including Rod Taylor and Franchot Tone. She co-starred in a total of six movies with Clark Gable. In 1933 Jean began an affair with the professional boxer, Max Baer. His wife, Dorothy Dunbar, threatened a very public divorce. To avoid further scandal, MGM execs convinced Jean to marry the cinematographer Harold Rosson. Jean went along with the ruse, since she and Rosson were friends, and they quietly divorced seven months later. She met and fell in love with William Powell and they reportedly were engaged for two years but were unable to marry because of varying opinions about children and the disapproval of Mayer. 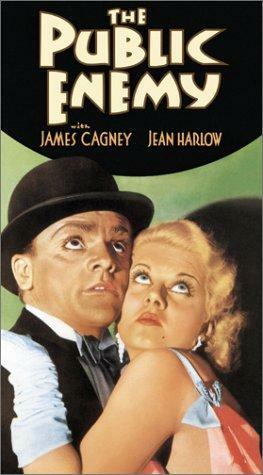 It was on May 29, 1937 while working on the film Saratoga with Clark Gable that Jean became ill with uremic poisoning. Care for kidney disease at that time was limited, and on June 7 she died at 26 years of age. Jean Harlow was MGM’s feature star in the mid-1930s and would surely have continued to be for many more years if not for her untimely death. She appeared in 36 movies in just ten years time. The studio enjoyed enormous profits from her movies well into the Great Depression, which is probably the reason the studio was able to survive the hard economic times. She left an indelible mark and has been the model “Blonde Bombshell” so many others, including Marilyn Monroe, have tried to imitate. 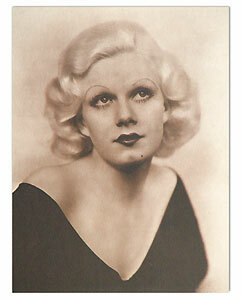 In 2012, TIME named Jean Harlow one of the all-time 100 fashion icons.